© 2006-2019 Fanpop, Inc., সর্বস্বত্ব সংরক্ষিত. Negasonic, Deadpool, Colossus, and অ্যাঞ্জেল Dust. . Wallpaper and background images in the Deadpool (2016) club tagged: photo brianna hildebrand negasonic teenage warhead ryan reynolds wade wilson gina carano angel dust stefan kapicic colossus deadpool 2016 mavel comics. 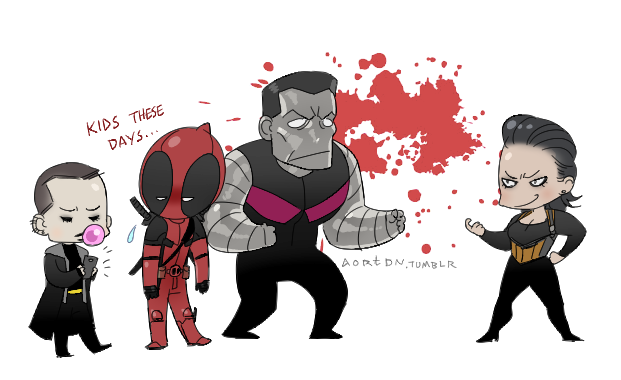 This Deadpool (2016) fan art might contain নকল মানুষের, কমিক বই, কমিকস, and কার্টুন. Tell Me, Do আপনি Bleed?